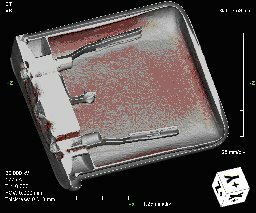 X-Ray Computed Tomography (CT), commonly referred to as 3-D imaging, is a computer model generated from multiple 2-D X ray images. ORS currently has two CT systems with different design and capabilities to accommodate a broad range of samples sizes and configurations. Individual images or “slices” are collected in the Real-time 2-D imaging mode. The collection sequence includes a 360º rotation of the sample about an axis where the individual 2-D images are taken at predetermined intervals. The collection times can vary based on the number of intervals and frame averaging values selected. After data collection has been completed, the 2-D images are sequentially downloaded into a modeling program for 3-D image generation. Once a 3-D model has been created, inspection and image processing can be performed. The model can be rotated for various viewing angles, sliced to form section planes and filtered to remove obstructive content. Color may also be added for visualization enhancement. 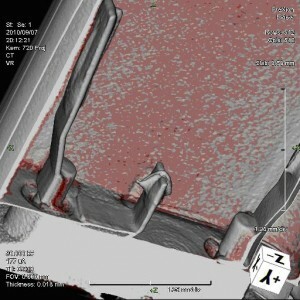 During the 3-D inspection process, individual images may be saved for presentation purposes. The entire 3-D inspection may also be recorded in an .AVI format for viewing by the end user. X-ray images slices may also be generated in three axis providing incremental virtual cross-sectioning inspection and physical measurements.